Talks to avert a pilots’ strike on Tuesday have broken down – and pilots’ reps don’t believe the talks are likely to resume. Most Aer Lingus flights are set to remain grounded on Tuesday and Wednesday of next week as a result of industrial action by pilots. 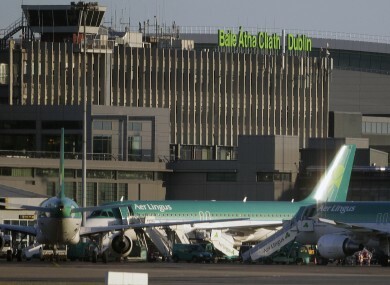 AER LINGUS TRAVELLERS are this morning preparing for days of air travel chaos, as talks between the airline and its pilots over the introduction of a controversial new rostering system broke down overnight. The talks between Aer Lingus management and the Irish Airline Pilots’ Association, which had objected to the new rosters being set for introduction next Tuesday, had aimed to avoid industrial action planned by the latter. But the talks, which continued late into the night at the Labour Relations Commission, broke down as the two sides failed to find common ground on major issues surrounding the new scheme – leaving the pilots on the verge of two days’ industrial action on Tuesday and Wednesday of next week. While the pilots are still set to attend work as normal, they are planning only to present themselves an hour behind schedule – a move which will force the airline to cancel all flights for the duration of the action. The flight cancellations will affect up to 30,000 passengers on each of the two days. A statement issued on behalf of the pilots’ union said that while “considerable” progress had been made on immediate problems around summer rosters, talks had broken down on the more long-term issues around rostering. While IALPA said it remained open to resuming the talks later in the weekend, it admitted such talks were unlikely to take place. Aer Lingus said it thanked the Labour Relations Commission for hosting the talks, and said passengers could change their flight arrangements free of charge at its website. Customers looking to cancel their booking for those dates could also do so free of charge, and will receive a full refund. A handful of Aer Lingus flights will be unaffected by the disruption: all regional services, flights to and from Belfast International Airport, and the Washington-Madrid route are unaffected by the cancellations. Disputes between the airline and its cabin crew over the introduction of the same rosters led to the removal of hundreds of staff from the airline’s payroll in January, and the cancellation of 22,000 flights. Email “Pilots strike looms as Aer Lingus talks break down”. Feedback on “Pilots strike looms as Aer Lingus talks break down”.